The Ultraviolet System is able to show the damage caused by the sun to the skin. An image can be taken and then converted into a UV image by a complex algorithm. 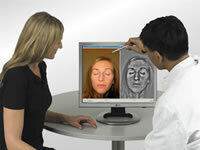 The UV scan is particularly important to show areas of skin that have had long term exposure to Ultraviolet radiation.